This product is perfect for hunting, training, and just having a good time at the range. It is economical, reliable, and effective. Rio Royal is manufactured in Spain and has become more and more widely available in the U.S. market in recent months and years. Great ammo - will buy again. However, these shells are just slightly longer than US 2 3/4 - my 590A1 8+1 Mossberg fits 7 of these, but 8 Remington into the tube - the shells are JUST slightly longer, FYI. Ordered 250 rounds-best price for what you are getting-anywhere. So far shells have been through both of my 12 gauges, no issues at all. Seems accurate as well. Hitting 3" circles at 25 yards with just a bead sight. Will order again. Ran through a number of makes of shotties. Semi & pump action. 1st case is gone. Ordering another one when our next prototype is ready to field test. NOT ONE PROBLEM WITH THIS AMMO! NOT ONE! That people, is frikken impressive. Love these rounds - good value. Great through my Remington 870 tactical. Never a problem - super fast shipping. Happy to keep buying. Ordered my 2nd lot - got it super fast and these are great running through my Remington 870 tactical shotgun!!! I just keep buying here - great prices, selection and fast shipping!!!! Function perfectly in my Mossberg 590A1. Will buy again! I've always been appreciative of the dependable and fast service from Lucky Gunner! Excellent 00 buck! I bought it for a training class, and it functioned flawlessly. I would use this brand for training or defense anytime. I purchased over a thousand rounds of these for use in law enforcement training, allowing us to save another brand for qualification and duty use. While there was an obvious difference in patterning, which I expected, functioning was perfect and we had zero problems in reliability. Because we shoot buck, bird and slugs during training, the translucent casing made it easy to identity these rounds as buck, though i wonder about the weather resistance of the crimp. It may or may not be an issue for your type of shooting, but 15 yards is the outer limit for us with this round. The groups were approaching 7 - 8 inches. Super service from Lucky Gunner, they must be telepathic. It's like the order arrived before I decided to place it. I've fired a couple hundred of these through my KSG and Saiga12, 0 FTFs and a good shot pattern. Excellent delivery time. Will definitely be ordering more. Just wish LuckyGunner still carried their rifled slugs. I purchased these to use in my 500 Mossberg and MKA 1919. Both run very well with no troubles. Pretty clean after 50 round in the 1919. Shipping is fast and love not having to backorder!! will buy more! Wow ...... I have purchased "a few thousand rounds from LG in the last couple years ...... alot of different ammo ..... this 12ga 00 buck does a great job , good product , price , BUT .... i have done business with a number of company's ...... NO ONE DOES ANYWHERE AS GOOD OF A JOB WITH CUSTOMER SERVICE AS LUCKY GUNNER ..... INVENTORY SERVICE AND DELIVERY ..... THE BEST ..... A PLEASURE TO DO BUSINESS WITH !!! Good price, fast service and excellent product. These shells feed and function in my 590A1 without exception. Rapid delivery and great price - will definitely order again from LuckyGunner! Fantastic value, shipped very quickly and shoots great... What else can you ask for?? This is my second order of Rio Royal 12 gauge 00 Buck, it is consistent and does what I need it to do in training. Ran through a Mossberg 590A1 with NO Issues!!! Shipping was Fast and the price was right!!! I received my order of 250rds of Rio 12ga OOBuck. Order came in excellent condition and shipping was very reasonable for this heavy package. I'm very impressed with the quality of the shells and their uniformity. This is a powerful shell with significant recoil. Shells appear to burn clean and function well. good stuff, good price, overall good value. Loved the product. it was just as advertised. LG is a great place to order ammo. You know exactly what is in stock and they ship within a couple of days. These 20 gauge shells feed good and shot well. This 00 buck cycles through my 870 smooth. Will definately buy more. Super fast shipping. Thanks Lucky Gunner for great service. Ordered 4 cases of this buckshot on Friday, was delivered on Saturday. Very pleased with the speedy service. 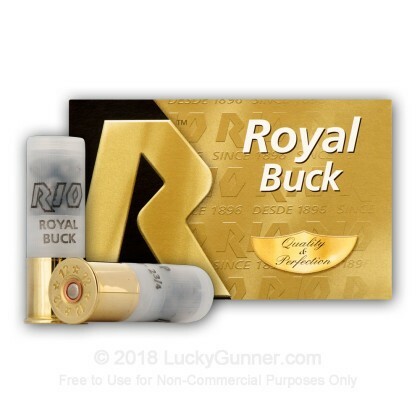 This buckshot is a great combination of quality ammunition at a good price. First rate construction and performance, this is now my first choice for buckshot. Good hard hitting ammo. Holds a fair pattern at 25 yrds. Wouldn't want to be it's backstop. 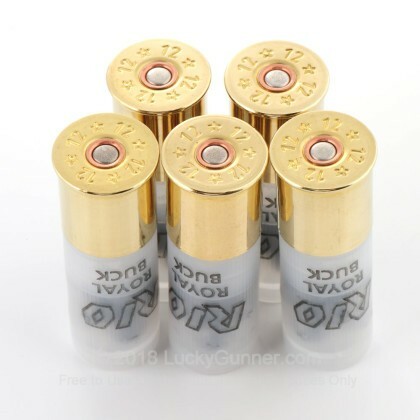 I used this ammo in a Saiga 12, This ammo does not fit in a MD arms 20 rnd drum but works outstanding in a SGM 12 rnd mag... I will be buying more of this ammo in the future..
Ammo came on time as promised and was in stock, what more needs to be said. I did find the ammo a little cheaper at other sites but none had any in stock. The real time inventory is great, no worry about out of stock or back orders. 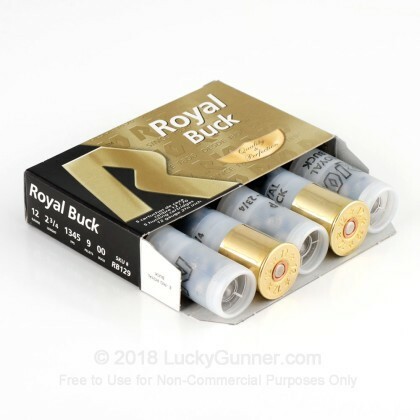 I would recommend Lucky gunner to anyone looking to stock up on ammo. 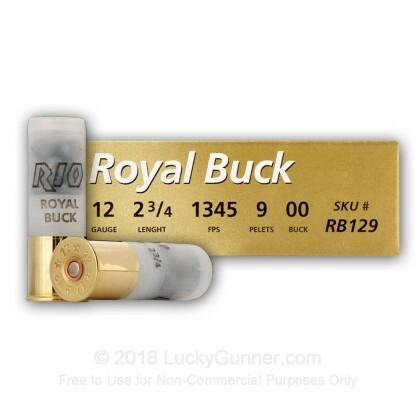 LuckyGunner was quite helpful with my order of the Rio Royal 00Buck shot ammo. It was delivered in a timely manner and it shoots well. I recommend LuckyGunner and this ammo. These shells work great, fed well, and repels zombies like a SOB no face eatin here!!!!!!!!!!!!!!!!!!!!!!!!!!!!!!!!!!!!!!!!!!!!! These have worked flawlessly in my Saiga-12 from the magazines, but are too big to fit into the 2 & 3/4 drum. I bought 250 rounds of this for my Remington 870 with a vang comp barrel. This stuff shoot and feeds flawlessly. My only criticism is that at 15 yds my pattern was about a foot wide with this stuff, whereas my federal buck was around 6 inches (which is why I gave this 4/5 on performance). For the price though, this ammo is definitely worth it! Amazing stuff for practice but not HD. Couldn't ask for more, your PERFORMANCE, VALUE & QUALITY are GREAT!!!!!!!!!!!!!!!! wow, great value for what you get!! Really fast shipping... ordered and was at my doorstep a little over a day later! Quality of shells is great and shoot nicely in my mossberg.!! This stuff shoots well and cheap. I'll take it all day long. Everything about this co. and its products are 5 Star!!!!!!!!!!!!!!! Thank you all very much. Could not ask for more in performance-Value or Quality. Good ammo, good service, will buy again. I bought 500 rounds for practice, not one malfunction from my Mossberg 590. recoil is very crisp, may even substute for home defense rounds at close range. Great value; Great service; Great cmpany!!! Great product for the price!!! We use these shells for hunting hogs out of a a helicopter so we need cheap shells that do the job and so far they work great!! Junk! I would not bet my life on this stuff. I was expecting good quality shells when seeing 22 reviews of of 5 stars... only to realize after shoot 100 shells that most of the previous reviewers had not even shot the ammo yet. About half of the shells would not feed, fire, or eject and were jamming constantly. I have shot a lot of different ammo brands through my Mossberg and have never had problems (I have never had a single failure in my Mossberg before these). I also had three other people shoot the ammo to see if it was just me and everyone had issues. That is when I got back from the range and compared them to some Winchester and Federal and realized that not only were these longer than the other brands, but the brass is larger and thicker, causing it to jam. I also found these for about $20 cheaper a day later on another site. I have loved Luckygunners prices, products, and customer service, but buyer beware on these shells.... They are decent for the range, but only half work so I am not sure the price is worth it. I could have bought Federal Premium for a buck each and got as many working shells. Extremely good quality ammo for the price....will purchase again!!! Great price....Point it with confidence and know what is at the other end will be obliterated. Functioned perfect no misfires or jams. Once again, the best service I've found with outstanding products at unbeatable prices! Great value for the money. Great product. A bit stout on the recoil, but stopped a coyote in it's tracks. Great knockdown power at 20 yards. Great company run the way they ought to be. Top notch. My favorite online ammo place! Simple easy to navigate website, no BS, shipped fast and excellent quality shells. Live stock counter, can't help but like the company. My new ammo supplier......Keep up the good prices!!! Very well pleased with the process. Have not fired any rounds yet. Plan to test fire rounds when the weather becomes more agreeable. I have every confidence that the ammo will be just right. Great price, too. I couldn't pass on this awesome deal and stocked up while I had the chance. Haven't had an opportunity to road test it but given the reviews above, I've got nothing to worry about. Thankfully the elections went as hoped and we didn't have marauding bands of raging liberals forcing me into a live-fire situation. Super prices, keep it up. This is some great ammo at a great price. It hits hard and I haven't had a single misfire after 500 rounds. Although the recoil is heavy, I wouldn't expect this to be low recoil ammo. Your shoulder will know when you squeeze the trigger on this stuff. three more boxs of 250 each. This is the best value in buckshot that I've found. it functions flawlessly. I just ordered 2 more cases. good ammo, at a good price, with good comms. Love it! Great ammo, great price, I have order 500 rounds and it was Great!!!!!!!! Grate ammo, Grate price, Have order 500 rounds and it was Great!!!!!!!!!! Rock solid ammo at an excellent price. Efficient, fast service from Lucky Gunner! 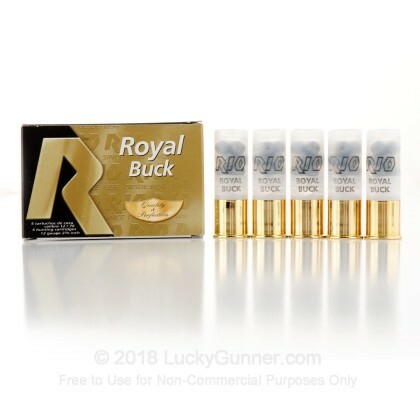 A: Hello Tony, This Royal Buck ammunition is a standard 9 pellet 00 buck with a velocity of 1345 fps loaded into high brass shells. 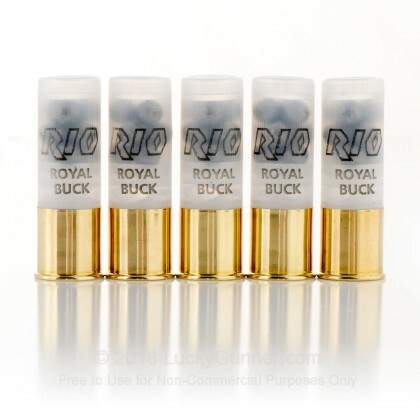 We also have this 12 Gauge - 2-3/4" 00 Buck - Rio - 5 Rounds ammo in stock in a smaller quantity.